In years when temperature, humidity and the timing of wheat heading conspire to create conditions for severe Fusarium infection, outbreaks can cost the Ontario wheat industry millions of dollars. In years when temperature, humidity and the timing of wheat heading conspire to create conditions for severe Fusarium infection, outbreaks can cost the Ontario wheat industry millions of dollars. 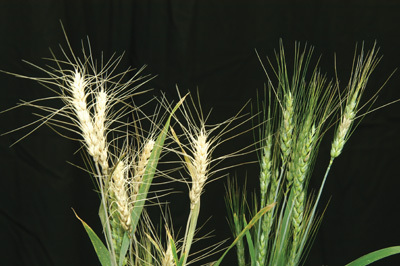 A number of winter wheat cultivars suitable for southern Ontario are ranked moderately resistant to Fusarium graminearum, the fungus that causes Fusarium head blight (FHB), but at least half are still ranked highly susceptible or susceptible, according to testing done by the Ontario Cereal Crops Committee (www.gocereals.ca). And most of the resistance that has been introduced to date comes from the Chinese source “Sumai 3”. So there is definitely room for improvement in wheat tolerance to Fusarium, something that researchers worldwide continue to pursue. Susceptible wheat cultivars (left) show severe damage from exposure to Fusarium compared to cultivars that have a resistance gene (right). Photo courtesy of Guihua Bai, USDA-ARS. For the most part, finding new resistance means testing many sources of genetic material to see if any have resistance genes that can be introduced into high-yielding, locally adapted cultivars. Both Dr. Lily Tamburic-Ilincic, a wheat pathologist and geneticist at the University of Guelph-Ridgetown Campus, and Dr. Guihua Bai, a United States Department of Agriculture (USDA) plant molecular biologist, are using this approach, but their potential sources of resistance genes are quite different. Tamburic-Ilincic is using modern, European and North American wheat cultivars, whereas Bai is going back to the old landraces that farmers planted year after year from seed that survived under local conditions before the advent of modern plant breeding. Tamburic-Ilincic and her colleagues at the University of Guelph are involved in multiple collaborations to find additional sources of Fusarium resistance. One of these is a project with researchers from Germany “to evaluate modern material from different parts of North America and Europe,” she says. The Canadians hope to introduce Fusarium resistance from European winter wheat into elite Canadian winter wheat, and the Germans vice versa. Another project they have been participating in since its inception in 1999 is the Northern Uniform Winter Wheat Scab Nursery, part of the USDA-funded US Wheat and Barely Scab Initiative. The nursery program evaluates North American cultivars for Fusarium resistance across 10 locations each year, and the best material is used for future breeding efforts. explains Tamburic-Ilincic. She makes crosses using conventional breeding and uses marker-assisted selection to make sure the genes of interest are present. The goal is to “pyramid” resistance genes from several different sources into single wheat cultivars. “Finally, the most promising lines are tested in both countries for yield, quality, agronomic traits, other diseases, and Fusarium resistance,” she says. Bai is screening about 100 landraces from China and 30 from Japan. He tests these for Fusarium resistance during a three- or four-year period using controlled, greenhouse experiments. So far, he has identified 10 to 15 landraces that have “pretty good resistance,” he says. Work is ongoing to map the locations of the resistance genes and develop pre-breeding material for plant breeders. Why use landraces from China? “Most US wheat is very susceptible to FHB,” says Bai. But China had several FHB epidemics in the 1950s, so the surviving landraces likely have at least some resistance to Fusarium. He says that although Canadian researchers already screened many of the landrace collections in the 1970s and 1980s, today’s testing methods are much more sensitive and accurate. Getting resistance into wheat cultivars for the Great Plains area, where Bai works, is of particular urgency, he says. FHB was never much of a problem previously on the Great Plains. However, in the last few years, it has spread south to areas such as Nebraska, Kansas and Oklahoma, and all of the currently available cultivars are susceptible to the disease. In the short term, breeders are working to move the resistance from Sumai 3 into the region’s cultivars, with newer resistance genes to be added in the long term as they are discovered. Aside from these usual methods of looking for specific resistance genes, Agriculture and Agri-Food Canada research scientist Dr. Rajagopal Subramaniam is using a novel technique to study another form of disease resistance in wheat. It works in a similar fashion to a vaccination. “Plants have their own immune system to fight diseases, and we’re trying to boost the existing immune system. We do that by vaccinating with a non-pathogenic strain, called a disarmed strain,” he explains. The wheat perceives the disarmed Fusarium strain as the real thing and boosts its general immune response. That protects the plant from infection by subsequent exposure, not only to virulent strains of Fusarium, but to many other microorganisms. The protection is short, however, lasting only 24 to 48 hours. 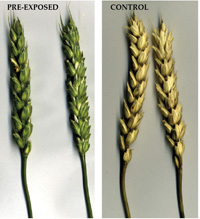 Pre-exposure to a disarmed strain of Fusarium graminearum (left) protects wheat from subsequent infection by the fungus, whereas wheat that received no such treatment (right) becomes infected. Photo courtesy of Dr. Rajagopal Subramaniam, AAFC. The end goal is not to inoculate wheat fields every couple of days, says Subramaniam. Rather, it is to figure out just how the general immune response, called basal resistance, is triggered in the plant. “It involves many different genes; that’s what gives the comprehensive resistance,” says Subramaniam. He and postdoctoral researcher Dr. Charles Nasmith are currently identifying the genes involved, which could number into the hundreds. A small fraction of those would be the ones responsible for recognizing the pathogen and turning on the rest of the genes, and are of particular interest. These investigations have just begun in the past five to 10 years, he says. Once identified, the genes involved in triggering basal resistance could be used in plant breeding and genetic engineering. For example, plant breeders could use genetic markers and marker-assisted selection to rapidly check that all of the important genes are present in any new cultivars. And it might be possible to modify the receptors that perceive pathogens, making them more sensitive or quicker to respond.